Demand Media on Monday announced that it had acquired Society6, a digital marketplace for artists, for $94 million -- including $75 million in cash and $19 million in common stock. The digital content company said the move would help further expand its offerings and accelerate its push into e-commerce. “Society6 augments and diversifies our content and media platform by adding an innovative e-commerce marketplace with multiple traffic sources and a large community of talented artists,” stated Demand Media CEO Richard Rosenblatt. Society6 sell a range of items, including iPhone cases, art prints, home décor, and T-shirts, based on work submitted by its community of more than 300,000 artists worldwide. Merchandise is created on-demand and sold on behalf of member artists, who get a 10% cut of gross proceeds and retain rights to their artwork. The site stands to benefit from increased exposure to Demand Media’s global audience of 100 million unique visitors, as well as its experience in managing content creation platforms, according to Rosenblatt. Demand, which owns eHow and Cracked.com, had a U.S. audience of 70 million unique visitors in May, according to new comScore data released Monday. The company plans to maintain Society6 as a stand-alone site and brand, with its three co-founders remaining with the company. Founded in 2009, the startup had revenue of approximately $15 million last year, and operating income of $4 million. 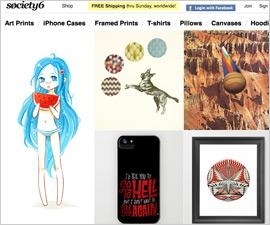 The Society6 deal follows Demand Media’s March acquisition of Creativebug, a Web site offering instruction videos on different arts and crafts. Unlike the free eHow site, users pay on an a la carte or subscription basis for 15- to-20-minute video classes. A Demand Media spokesperson said the purchase of Society6 reflects a further step into “creative commerce” online, in the manner of sites like CafePress and Shutterfly. Demand Media also cut its revenue forecast for the current quarter to a range of $100 million to $101 million from a previous estimate of $105 million to $107 million. It attributed the reduced outlook to a decrease in search engine referral traffic to its owned and operated sites. The company last month reported an adjusted profit of nine cents on revenue of $100.6 million first-quarter, beating Wall Street estimates. It had revenue of $380.6 million last year. Demand Media is in the process of spinning off its domain registry business from its online media one, with the split expected to be completed by year’s end or in early 2014.